It is now early November and, as a professional machine quilter, you should be either approaching or you are knee (or neck) deep into your busiest time of the year – quilting for Christmas! If you have been quilting for a while, you should have an established client/customer list. If you are a new professional quilter you may be looking for ways to expand your client/customer list. Or, you may be looking for a way to bring in more quilts, which equals more $$ into your business. If you are a new professional quilter, send notes to your friends, family or anyone else that you think would be interested in your quilting services. Encourage them to pass the note along to their friends and others. If you belong to a quilt guild, bring some notes to the meeting and pass them out or leave them on a “free” table, if you guild has one. If you belong to any other groups or clubs – quilting related or not – be sure to bring the notes when you attend the meeting and tell the group/club what you are doing. One of the hardest things to learn, especially for women of a “certain” age, is the somewhat shameless self promotion that is needed when you are in business. Don’t be afraid to tell people what you do! You are a professional quilter – and not many people can do what you do. If you have a smart phone or other mobile device, make sure you have photos of your work saved in the memory or gallery. Show your photos to anyone who is interested. (Make sure you include a photo of your quilting machine. People will then know what kind of investment you have made in your machine and in your quilting skills.) Once people see what you do, they will understand and they will remember you. Take the time to write up some notes, put them in the mail to your customers, friends, family and others. Don’t hesitate! Do this NOW and see how much your business will increase. I value your comments and your input. If you have sent out notes in the past, please let us know how it worked for you. If you use your smart phone or mobile device to promote your business, please let us know how you do it. It has been busy the last few months since I last posted and a lot has been happening in my life. I generally don’t post about my personal life on this site, but, recent happenings have affected my postings. When my right hip was healed after the surgery, it turned out that my left hip had significant arthritis (and pain) and it needed to be replaced, too. After much thought and consultations with my doctors, it was determined that replacing my left hip should be done sooner rather than later. So, on October 16 (five months after my first hip replacement) I had my left hip replaced! My recovery from the second surgery has been MUCH easier than the recovery from my first hip surgery. At only three weeks after surgery, I am walking with a cane and I have NO pain other than some occasional surgery discomfort, which is decreasing every day. I feel GREAT and I can’t wait to get back to the quilting machine in the next few weeks. Even though I am still “recovering” I have already pieced a quilt top for a Christmas gift and will be working on a few more quilt tops over the next few weeks. 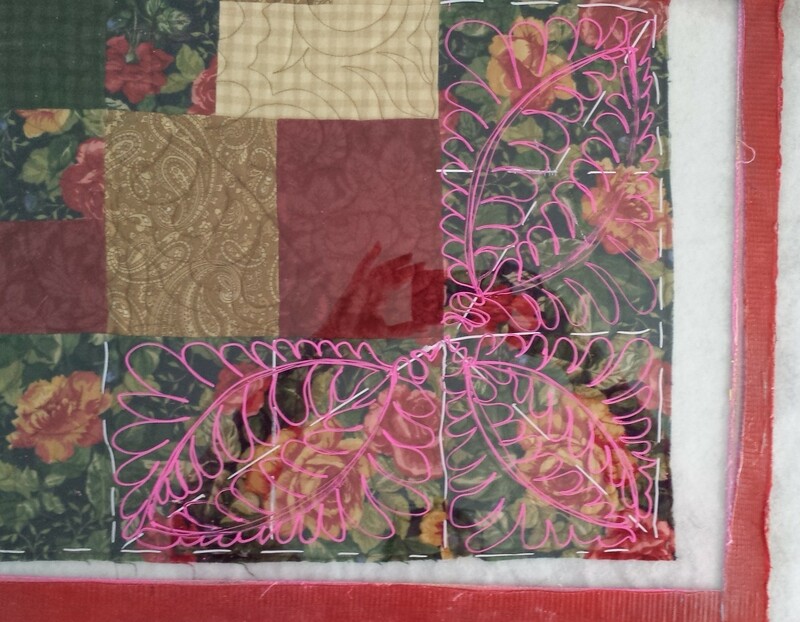 I am also doing a lot of computer work including working on new pantograph patterns, new quilting designs, new piecing patterns and outlines for some new online classes, including the 2013 New Years Day Mystery Quilt. I am planning on getting back “on track” with posting to this blog on a more regular basis and working on my custom quilting business – which has been on hold during my surgeries and recovery. If you have had a situation where you had to take a “vacation” from your quilting business due to surgery, illness or some other life situation, (we don’t need to know personal details) please let us know how you were able to come back to your business, hopefully a stronger, better person and a better quilter. I am truly grateful for modern medicine and the dedicated Doctors, Nurses, Physical Therapists and all the other health care professionals that work so hard every day to keep us all healthy and moving without pain.